First Assembly DeLand is passionate about equipping the Church with tools for building a life of prayer in each individual believer’s heart, a house of prayer in each believer’s home, and a culture of prayer in each partner ministry. The frenzy of modern life makes it hard to sustain a secret life in God. 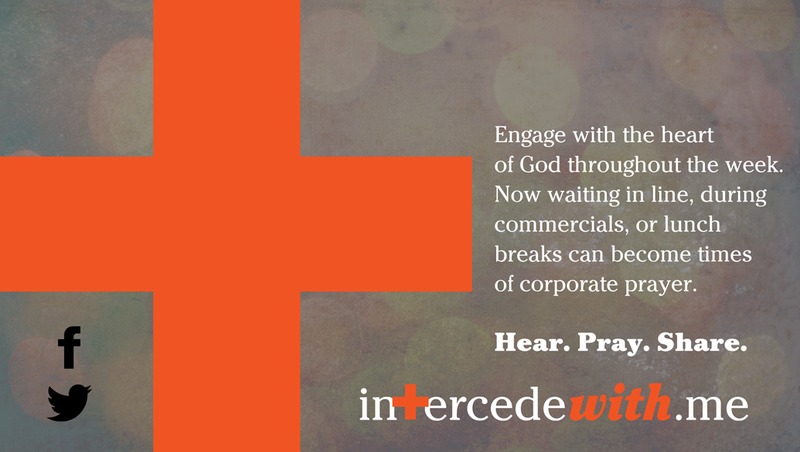 To that end, we built intercedewith.me to help you build prayer into your daily life. Visit the site whenever you find yourself with a free moment – in line, on your lunch break, in the evenings before you turn on the TV – and take some time to engage in prayer with the current focus. Intercedewith.me is the brain child of my good friend Mark, our pastor, and myself. We have been trying for years to get a greater amount of people at our church to pray. We’ve experimented with many different things and while some people did engage, we realized that some people saw “prayer times” as a special service or an elitist thing to do. Many people didn’t see it as something practical or something that they could do at anytime or anywhere. We were praying and thinking of ways to help and teach our church to pray throughout the day. We wanted to show them that prayer is for everyone and doesn’t have to be hours long to be effective. I’ve talked before how, sometimes, 15 second prayers, prayed throughout the day, are better than a whole hour once a day. It’s all about constant communication and conversation. It was in that heart that intercedewith.me was birthed. Mark had an idea of making a online, mobile-friendly site where people from all over could engage with a prayer focus and, if they wanted to, leave prayers about the prayer focus on the site. It was an amazing idea and something that I’ve never seen done before. While people are waiting in line at the grocery store, they can open the website on their phones, hear/see the prayer focus, and engage in prayer in their heart and online….all while still in line! We added the ability where people can also share the prayer focus and/or their prayers with their friends on Facebook, Twitter, or Google+. As a designer, I understand the opportunity cost to the things we attempt to do. The theory is if we make something easy enough, people are more likely to do it. While praying does involve time, focus, and attention, intercedewith.me is not meant to replace a believer’s personal prayer life. Rather, it is to boost and encourage their prayer life by stirring their faith and passion as they join with others believers in prayer, just like corporate worship times should boost our desire to worship at home. I encourage you to check the site out and engage with us as we pray throughout the week for different issues. You can follow us on Facebook or Twitter to see when a new prayer focus is posted. Praying for a nation and for God’s will can sometimes be a little tricky. You don’t want to pray that God will bless your nation with abundance when they are rebelling against God. Yet you also want to stand in the gap and pray against judgment and that God in His mercy will draw people to Him. So what do you do? You can never go wrong praying from the Bible for something. When we pray the Bible, we are praying the will of God. This is important. The Bible tells us God’s heart and by praying it we are appealing to God for what He already wants. Here are my four favorite scriptures that I pray over America. They can also be applied to any nation. I have italicized the parts I really focus on. What is a worship team’s first and main responsibility: engaging with God or leading people? This question is probably the greatest and most argued question in the Christian worship world. Many sermons, commentaries and conferences spend their time debating whether worship teams and leaders should make their main focus seeking God or whether they should focus on the congregation they’re leading. This is the person that comes to each service ready and prepared to worship. These worshipers are what I call “the worship team encouragers.” They are passionate, alive and in love with Jesus and whether they physically express it in their praise to God, their heart is engaging with God before the first note is played or sung. This is the person that comes to a service a bit unfocused and distracted or a little cold of heart and lacking in passion. This person will usually engage in worship by the end of the worship set, it just takes several songs before they’re heart comes alive. These people love Jesus greatly, but they struggle choosing to push through the worries, troubles and pressures of their lives in order to worship corporately. This is the person who either does not know Jesus or is so cold feeling towards Him. They come to church services either out of duty or to soothe their conscience. They may like or not like the music, the lights, sermon, songs, but regardless of what their opinions are, their hearts are unengaged. Now upon looking at these three types of worshipers, we must ask what is the solution and answer for all three types. What is the answer for encouraging white-hot worshipers, re-igniting “smoking flax” worshipers and birthing love into those who are cold or unsaved? Lights aren’t the answer. New songs with driving guitars isn’t the answer. Using the best skill and talent available isn’t the answer. The only thing that can engage all three types of worshipers is the presence of God. Only an encounter with the Lord can encourage, re-ignite and break through to the heart of all types of worshipers. There’s a powerful thing that happens when we worship and draw near to God (whether indivdually or corporately). The Bible says that God draws near to us. His presence comes close to our hearts. The God who is a consuming fire, the fountain of joy and the healing balm comes close to us, engages and ministers to us when we worship Him. People who are struggling with addictions, shame or a host of other issues are set free when God draws near. Worship is the highest form of intercession. When we lead worship (instead of following people’s emotions for that service), we are reaching out to God asking Him to come and minister and touch His people. We are asking for the rain of the love of God to come and soften the hearts of His people to receive the Word that is to be preached that service. We are standing in the gap for those who are bound and can’t cry out for themselves. I believe that you can focus on people during worship and still worship God as long as we are not taking ques from the congregation concerning how passionate we should be. Whether or not the congregation is stirred, we should give God our all, because after all is said and done, we are ministering to an audience of One. Our greatest hope and prayer should be that as we worship God with all that we are, He would draw near not only to us, but to all those who are following us. That is our #1 cry, hope and focus. This is a follow-up post to Help To Better Fast. I believe that fasting can change people, cities and even nations. That said, I believe it’s what we do after the fast ends that brings about the longterm difference. I consider seasons of fasting to be like a powerful conference — God can speak to you during it, you can feel moved, dreams can be reawakened, but if you don’t follow through after it’s all over then it’s been little of actual value for the long run. These are just a few practical things and a few spiritual things to make sure your fast is as effective in the long run as it was in the short run. Practically speaking, this means that if you haven’t eaten food for over 3 days then you should take it slow. If you haven’t ate anything for a week or so, don’t try eating steak right away, no matter how good it smells. I promise you it will be painful later, if not dangerous. Start off with bread, soup and salad. This is why Olive Garden is my favorite place to end a fast. The soup, salad and breadsticks combo is filling yet safe to eat. Spiritually speaking, this means that you should not try to make up all your lost time by binging on media, food, or other things that you were fasting. Especially with longer fasts, you have trained yourself to eat and live a certain way. Do your best to keep the godly parts of that. Tailing off the end of point one, it is imperative that you decide not to take any spiritual time off after the fast is over. The few weeks after a fast is over, when the flesh is regaining it’s normal strength, are the most important to cement habits and practices you established when your flesh was weak during fasting. I encourage you to strive to keep your same prayer and devotional schedule the same as it was while you were fasting till it becomes a normal day to day habit and something ingrained into your life. Fasting should be a regular spiritual discipline in our lives. It’s a excellent way to keep our hearts and spirits in check and to make sure we’re not slipping into apathy or coldness of heart. I encourage you to plan and schedule your next fasting time before you end your current fast. I say this cause your spirit will look forward to it but your flesh will fight it tooth and nail once you end your fast. I know that most people are more quick to say “we should fast more” at the end of the fast than they are a week later. Schedule your fasting time and stick to it. If you don’t know when to fast, pray and ask God when you should. He may call you to something weekly, bi-weekly or monthly. I highly encourage a few continual days of fasting every month at least. Again, this helps makes sure that every month we’re evaluating our hearts in the place of prayer and fasting. We ought to do it more than once a month, but monthly is better than never doing it. For those monthly fasts, I highly encourage you to join the Global Bridegroom Fast (GBF). The fast is held the first Monday, Tuesday, and Wednesday of every month during the months of January to November, and the first Monday through Sunday of December, making a total of forty days of fasting each year. You can find out more information about the fast here. Decide to keep the atmosphere in your house and your life acclimatized to prayer. Choose to make sure your friendships and relationships are those who pray and who encourage you to pray in return. I also encourage you to start listening/watching the IHOP (International House of Prayer) 24/7 Prayer Stream. It’s free and it’s a way to use your speakers and/or TV in a way that’s not going to numb your spirit to God. You can view it free here. Finally, the last thing I would suggest to make sure you don’t waste your fasting after you end your fast is to start a Bible study. This can be by yourself or it can be with your spouse, your family or a group of friends. The point of this is to move past the point you are during the fast, that you would grow after you fast not just during it. There are many great personal Bible studies. I personally recommend any from Beth Moore or Mike Bickle (free!). Many of these can be adapted for a small group. I also recommend doing any from John Piper as a group study (especially his Seeing & Savoring Jesus Christ DVD/book study). At the same time, sometimes the best thing to do is get together, open the Bible and pray and talk about it. Decide that you want to know Jesus better before the next fast and this will make sure that your fasting propels you somewhere deep in God. I decided to post some quick points and resources to help people pray, particularly for my church during this 28 day prayer initiative we’re in. Jesus, I pray for my church. I ask that you would pour out Your Spirit upon us. I pray that right now You would reveal Yourself to every member and every leader. Speak to their hearts and encourage them with Your love. Praying quick prayers like that out loud or under your breath will keep your heart engaged with God throughout the day — and that is the point of prayer. It will train you to pray more and longer. It will also keep you connected to the Spirit to hear what He speaks to you. 15-30 second prayers will change your life completely if you do it consistenly. Father, You love all the world. You love the lost. You desire none to perish but all to believe in Jesus Your Son. I pray that Your Word would run swiftly in the city, that as Jesus is preached, You would convict hearts and bring them to salvation. Make people’s hearts tender to receive You I pray in Jesus name. Worship and focus your mind and heart on God. Ask Him what to pray for. Whatever you feel He wants you to pray for, pick a scripture and use it in your prayers. This list of scriptures to use is a great help. This is something that I find myself neglecting in prayer. I have a tendency to think of tongues as something used just for corporate prophecy, but it is primarily a tool for prayer. There is nothing that will engage and focus your heart to seek God and pray like praying in tongues. If you are not filled with the Spirit, ask the Lord to baptize you with this gift. He loves you and desires for all His children to have it. After you ask for the gift of tongues, open your mouth in faith and start speaking. There are also times where we run out of words to pray or we don’t know what to pray for a certain focus. The Bible says that during these times, His Spirit prays through us the perfect will of God. He does this through tongues, groanings and utterings. I hope this has helped equip you to better engage with God in the place of prayer. The year was 2000. I was 16 and had just come back from the original CallDC rally a few months earlier. There were a couple dozen of us who went and came back truly transformed. It wasn’t hype or a spiritual high, it was a complete spiritual overhaul. We came back changed and longing for God. That Christmas, I decided to make a prophetic statement and pray a prayer of faith. 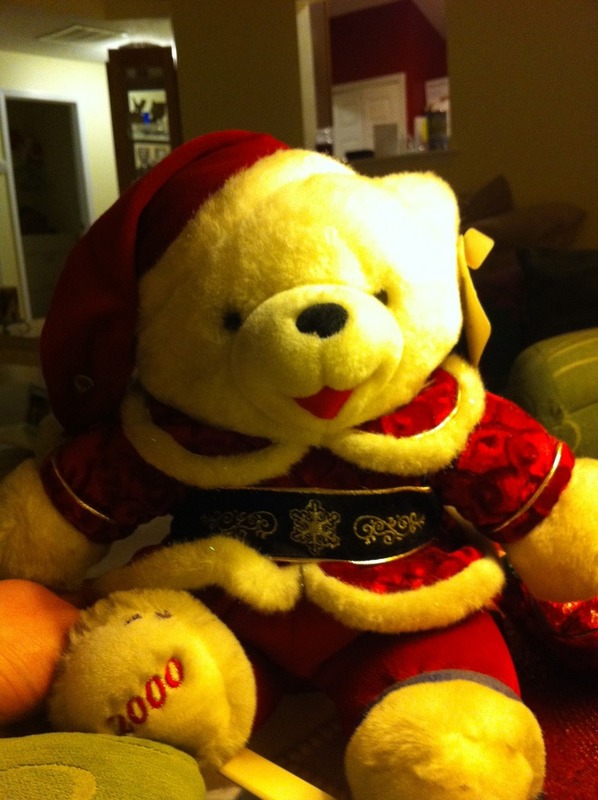 I went to Walmart and bought over 20 of their $5 Christmas bears (see picture). With no explanation of what it meant, I gave a bear to each of my friends that year who were close to me and who were seeking God passionately. My prayer (and what the bears symbolized) was that 10 years from that time I wanted to see everyone that got a bear still passionate after God. I didn’t want them to *just* still be going to church or saying they’re a Christian. I wanted them to still be as on fire (if not more) as were were 10 years ago around Christmas. As the years went by, some friends moved away and some stayed. Some became rooted in ministry and some waned in their spiritual walk. But every year I would look at that Christmas bear (which I never packed away but kept in my room) and prayed and believed God that my prayers and desire would become true. So here we are, 10 years later. I forget some people who I gave the bears to and others I remember. It’s been a beautiful time remembering these people and friends and seeing them with God even after a hard decade. I am truly grateful at God’s love and mercy, cause it’s only His grace that has kept us. Even the ones that are away from God right now, no one has died from the group. He is still merciful cause there is still time. So if you have a bear, take a moment and (1) thank God for keeping you regardless of your spiritual place with God and (2) think of your bear and let it move you closer to Him.